Mattel is sending a letter out to people who had subscribed to the, now canceled, Ghostbusters Subscription Plan. When the plan was caneled, the Ecto-1 that was supposed to be a part of the plan was yanked from the schedule. As an apology, Mattel is planning on sending those who subscribed a freebie as a thank you. 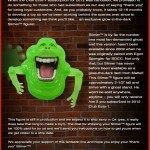 That freebie is a Ghostbusters: 2.5″ Glow-In-The-Dark Slimer. Click the thumbnail to read the letter going out to canceled sub members. Discuss on the Toyark Forums› Views: 3275 › Credit: T16skyhopp of the Toyark Forums! Got this in my email. I'll take it. I dig GitD but was hoping for a proton stream set. I have this 2x already, plus the retool. Cool. I was expecting a proton stream set as well. 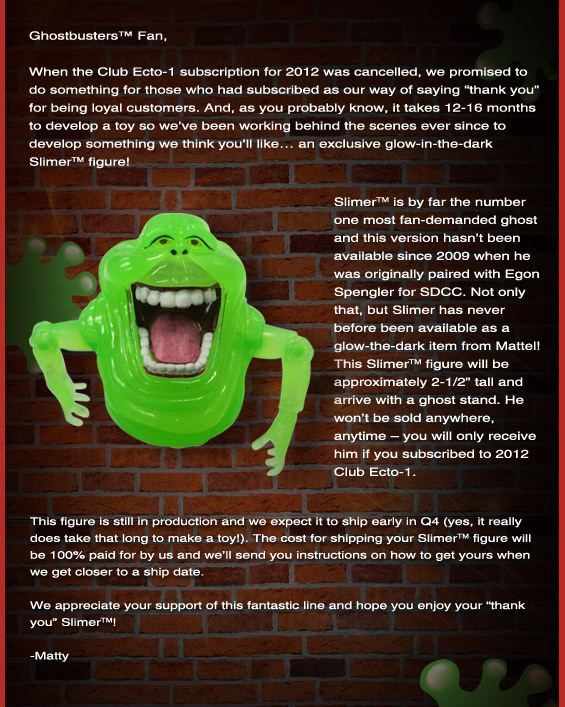 Would have preferred that, but I'll take Slimer. I can definitely respect Mattel in doing this. They've outdone Hasbro now (damn them pushing Joes back now). I'm pretty sure the movie delay isn't Hasbro's call, but Paramount's. It will cost Hasbro a ton to delay toys. I'm sure they had to be against it. Just got a shipping notice for this, so they are on their way. When I first glanced at the email on my iPhone I thought it was a Matty Collector screw up and they were invoicing me for something I didn't order. It's pretty cool that they're doing this. Yeah, I got my email a couple days ago, it is a nice gesture, but some proton streams would have been nice also. You know what would be really nice of Mattel to do is ship the 100 dollar dragon they had to offer us before Christmas. Waiting a year for a free fig you already have is bad but making us pay for something expensive right before the holidays and then not shipping it is worse. 15 + days is an unacceptable shipping notification window. I can't wait till they announce 2013 delays days before they expect our money in there pocket. Cool for you guys who get the free figure, but that Slimer pales in comparison to Neca's.